The Catenian Association is an international brotherhood of Catholic business and professional laymen who meet socially once a month to help, support and encourage each other to fulfil their various vocations and duties. This could be in their family, religious, social, professional and business lives. The help and support is offered by prayer, practical and financial help if needed and results in the forming of lasting bonds of friendship between each other and their families. It was founded in Manchester in 1908 following a pastoral letter from the Bishop of Salford calling for the laity to use their talents to take a leading role in society. The association now has over 10,500 members throughout the UK, Australia, Africa, Malta, Ireland and Goa. Members form local groups called Circles. The term “Catenian” is derived from the Latin for “chain” and symbolises the links which are formed within and between the Circles and their members. 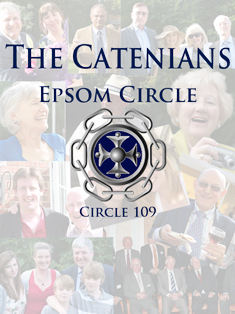 Epsom Circle was founded in 1934 and is the 109th Circle of the Association. We meet on the third Thursday of each month at the Royal Automobile Club. At the time of enrolment a member solemnly promises to attend his Circle meeting regularly unless he is prevented by some reasonable difficulty. He also promises to assist his brothers in difficulty or need. Every year the Fund supports young Catholics from all over the world who volunteer to do something wonderful and help those less fortunate than themselves. Whether this is on an individual project, or with others – or even if you are planning to travel to Lourdes or on the Jumbulance to help an assisted pilgrim - we would like to help you to achieve your aims.